First, one intrepid player tackled Dark Souls with a Rock Band guitar controller. Now the same guy is taking the notoriously difficult title on with a drum set from the rhythm game. AKA "It's got a good beat and you can die to it." Seriously, though: this fight looks a lot harder when you're pounding it out on a bunch of pads. 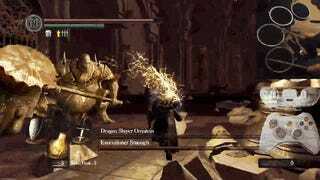 The most interesting thing about Bearzly's showdown with Ornstein and Smough is how he's controlling his character. He needs to use the d-pad for movement but has the camera mapped to one of the drums, making it extremely difficult to run and keep sight of the bosses at the same time. All of that makes me have even more respect for his dodging skills. One question kept running through my mind as I watched this video: What would this sound like as an actual piece of music? Probably like something from Metalocalypse.